There'll be a few hearts in mouths if next weekend's FA Cup semi-final between Southampton and Chelsea goes anything like today's dress rehearsal. With Burnley's win over Leicester City opening up a chasm between seventh and eighth spot in the Premier League, it now appears likely that only the Saints stand in the Clarets' way of Europa League inclusion. 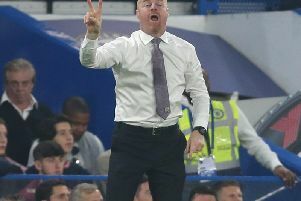 While a sixth place finish, a guarantee of European football next season, isn't beyond the realms of possibility, Sean Dyche's side, and supporters alike, will be hoping for a Blues victory under the Wembley arch. Just like Southampton at St Mary's, Burnley went in to a 2-0 lead against their opponents, only it was a margin they would protect more convincingly to strengthen their ambitions. Four years ago, as the Clarets battled the Foxes for the Championship title, record signing Chris Wood scored a spectacular goal to give the visitors the advantage at Turf Moor. This time, in the same fixture, with his loyalties switched, the New Zealand international netted with a much simpler strike, though it was one that put the home side's noses in front in the fight for Europe. There were only six minutes on the clock when Ashley Barnes picked out his strike partner with a tremendous pass before Wood, played onside by Ben Chilwell, slid the ball past Kasper Schmeichel at the second attempt. And three minutes later the lead was doubled. Wood was heavily involved once again, chasing a lost cause to win a corner off Harry Maguire and it was the England international centre back who was beaten in the air by Kevin Long from Johann Berg Gudmundsson's corner as the Irish defender claimed his first league goal for the club. A response was the least you'd expect from Claude Puel's men, though the home side handled their reaction well. Nick Pope pulled the ball down on his line after Riyad Mahrez's attempt looped awkwardly off the boot of Long. Pope should have been tested again when Chilwell did all the hard work down the left hand side to sit the ball up for Jamie Vardy but the Foxes forward couldn't direct his header on target. The Clarets goalkeeper, who earned his first England call up last month, did stand up to the test, once again in front of Three Lions boss Gareth Southgate, when City came forward again. Mahrez didn't have to break his stride from Demarai Gray's delivery and the Algerian did everything asked of him with his header but Pope saved well with his legs. The 25-year-old former Charlton Athletic stopper was well-placed to claim Vardy's header after Maguire had found himself in a crossing position but he could only watch when Mahrez almost pulled a goal back with the last kick of the half. After James Tarkowski conceded the free kick when bringing down Shinji Okazaki 20 yards out, Mahrez's set-piece flicked the outside of the post. Leicester continued to up the ante in the second half and the home side were forced to weather the storm. Burnley threatened early on when the ferocity of Gudmundsson's drive had Schmeichel beaten but the ball just cleared the crossbar. Vardy, who holds the record for most Premier League goals scored in successive games, was pushing for five consecutive games on this occasion but the striker was once again foiled by Pope. The one-time Fleetwood Town frontman had little pressure on him when rolling the ball towards the corner from Adrien Silva's incisive pass but Pope made full use of his height to stretch out and turn the effort around the upright. It will be 12 months tomorrow since the Clarets were awarded a penalty - that came in the 3-1 defeat to Everton at Goodison Park. And Martin Atkinson showed very little interest when substitute Fousseni Diabate mistimed his challenge on Aaron Lennon, missing the ball completely as the winger went over in the box. That decision changed things somewhat. Not long after, Leicester City pulled a goal back to pile the pressure on. Kelechi Iheanacho broke through the middle and fed Vardy who powered the ball past Pope and in to the roof of the net. The visitors went close to an equaliser on a number of occasions as they threw caution to the wind but the Clarets held on to record a fifth win in a row in the top flight. Forget Brexit, make sure you're passports are in date, because we're all going on a European tour!